Fig. 1. Schematic summary of BMPR2 and its associated proteins in the BMP-mediated signaling cascade. Different BMP ligands engage BMPR2 and different corresponding type 1 receptors, such as ACVR1, BMPR1a, BMPR1b and ALK1. BMP4 and BMP6 ligands bind to a receptor complex consisting of BMPR2 and ACVR1; BMP2, BMP4, and BMP6 bind to BMPR2 and BMPR1a; BMP2 and BMP4 bind to BMPR2 and BMPR1b; and BMP9 and BMP10 bind to BMPR2 and ALK1. The activity of ACVR1 is negatively regulated by interaction with FKBP12. Endoglin, as a co-receptor for ALK1, promotes the receptor complex formation. 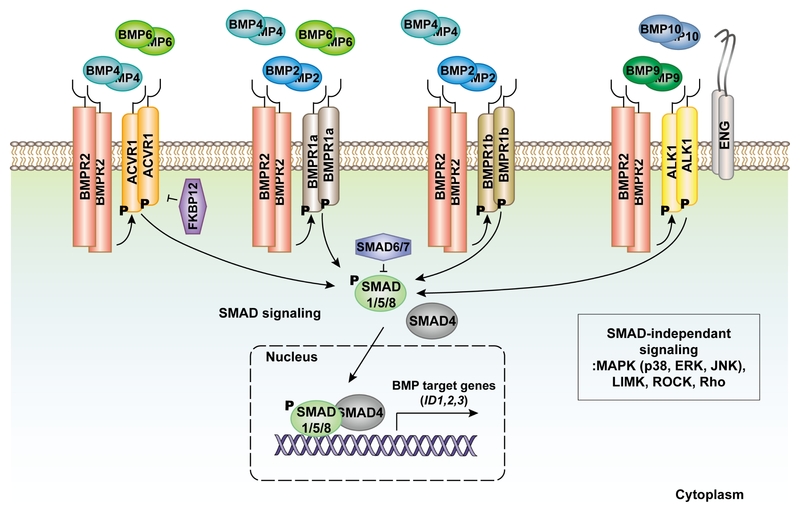 Engagement of BMP ligands triggers SMAD1/5/8 phosphorylation, which then binds to SMAD4. The SMAD complex translocates into the nucleus to induce target gene expression. SMAD6 and SMAD7, which are induced by BMP signaling, bind to type 1 receptors and thus, negatively regulate BMP signaling by negative feedback loop. Some of the BMP target genes, including ID proteins, are indicated. MAPK, LIMK, ROCK, and Rho are activated by SMAD protein-independent manner.